Hi there! Sorry for not writing on my blog for the past month been really busy. (if someone actually reading it) *laughs*. 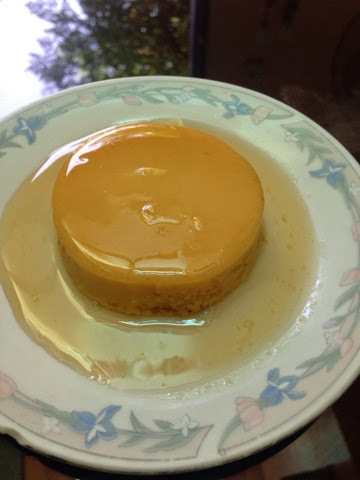 Anyway today I'll teach on how to make a Crème Caramel, here in the Philippines we call it "leche flan". 1. On a mixing bowl put the egg yolk and beat it slightly, set aside. 2. Warm the Evaporated milk in a sauce pan, let it seamer for a couple of minutes until you can smell the aroma of the milk. 3. Add the warm evaporated milk into the egg yolks, make sure you stir it while you pour your milk, to avoid the egg to be cook. 4. Add the condensed milk and stir until it is mix, add the sugar stir until the sugar is melted with the mixture. 5. On making the syrup, in a pan add the sugar and water don't stir the syrup let it seamer and let the sugar melt on its own. We avoid on stirring the syrup so it will not turned into candy. ☺️ If the syrup is reduced slightly and put the syrup into molders or cups. 6. Add the egg mixture into the molders (skim the bubbles) and let seamer for a couple of minutes until cook. Try pricking a toothpick on the mixture if the toothpick comes out clean it means its cook.